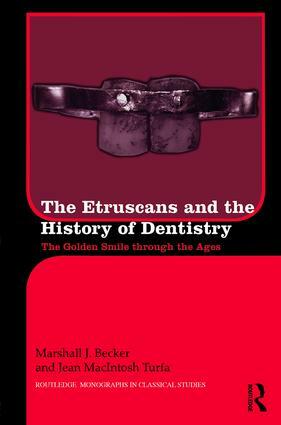 The Etruscans and the History of Dentistry offers a study of the construction and use of gold dental appliances in ancient Etruscan culture, and their place within the framework of a general history of dentistry, with special emphasis on appliances, from Bronze Age Mesopotamia and Egypt to modern Europe and the Americas. Included are many of the ancient literary sources that refer to dentistry - or the lack thereof - in Greece and Rome, as well as the archaeological evidence of ancient dental health. The book challenges many past works in exposing modern scholars’ fallacies about ancient dentistry, while presenting the incontrovertible evidence of the Etruscans’ seemingly modern attitudes to cosmetic dentistry. "This study is vitally important for our knowledge of the history of dentistry, especially for the Etruscan period. It is extensively researched and combines the subjects of biological anthropology, medical history and material cultural studies to provide a rounded approach to the history of dentistry. This book is a valuable contribution to scholarship on ancient perceptions of dental health and conceptions of beauty and is highly recommended for anyone interested in the medical humanities." "Becker and Turfa’s book celebrates Etruscan gold-band dental appliances, ancient prostheses that should be better known … Becker and Turfa’s book is written in a lively style with ample sign-posting for scholars "reading around," but has also been well-designed for non-classicists, both scholars of dental history and interested lay-people. The authors have crafted a unified, mostly smooth voice that invites readers into the denser discussions and punctuates these with vivid vignettes of ancient life, especially dental pain; footnotes are minimal and comparative evidence thoughtfully deployed." Marshall Joseph Becker is Emeritus Professor of Anthropology at West Chester University, USA, and is a Distinguished Member of the American Anthropological Association. Jean MacIntosh Turfa is a Consulting Scholar in the Mediterranean Section of the University of Pennsylvania Museum, USA, and a Foreign Member of the Istituto di Studi Etruschi, Italy.